When we get to the Geneva Motor Show next March, Swiss design house will be showing off a design for a new electric commuter vehicle called the UC? (question mark included). The design of the car itself doesn't appear especially novel with styling that looks like a cross between the Smart ForTwo and Fiat 500. However, Rinspeed is proposing an interesting approach to extending the range of the EV. Because the UC? is only 2.5 meters long, it could take advantage of the same kind of perpendicular parking that many Smart drivers use. With that in mind, Rinspeed is proposing special train cars that would allow the car to be driven straight on and off for travel between cities where the 75 mile nominal plug range would be impractical. Since most European trains are electric, it's even conceivable that the car could be plugged in during the train trip. Rinspeed hopes to offer up the UC? to manufacturers that want to build it. Geneva Preview: Rinspeed to unveil the UC? electric city car, which is train compatible originally appeared on Autoblog Green on Wed, 16 Dec 2009 14:56:00 EST. Please see our terms for use of feeds. 0 comments on "Geneva Preview: Rinspeed to unveil the UC? 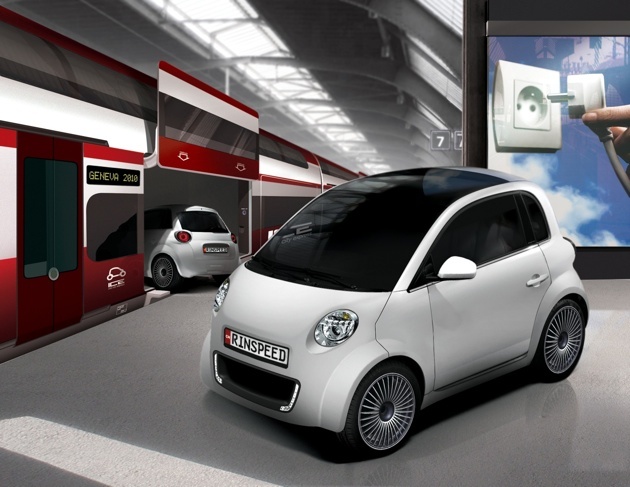 electric city car, which is train compatible"